How do I find, export, email and/or set on hold a specific group of subscribed members? You can set multiple filters under the Subscriptions header in order to help you find the group of members in which you are interested. Make sure that the relevant season is selected in the upper left corner of the dashboard before you set your filters. 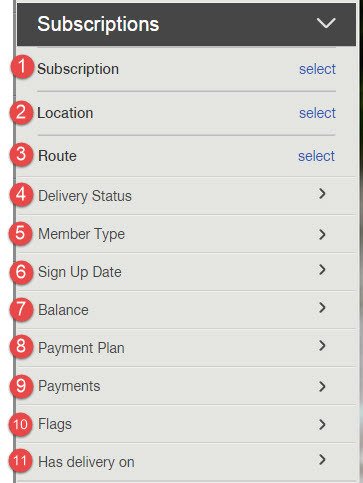 In order to define the Subscription, Location, and Route filters, click on "Select" next to the filter. When the prompt appears, select the items that you would like to filter for and click Apply. Then click the Find Members button once you have defined all desired filters. You may choose more than one item in the list. Use the search search box to narrow the list of options. For the following filters, click the arrow next to the filter to view the list of options. You may choose more than one option for each filter. Temporary Hold: Shows members that have a temporary hold scheduled as of today. Permanent Hold: Shows members that you have put on an indefinite hold. Not on Hold: Members who do not have any hold placed on their account will be displayed. Host: Only hosts that have a subscription for the selected season will appear in the list of results. Click here to learn more about how hosts work. Member: Both hosts and members will appear in the list of results. Enter a range of dates to see a list of members who signed up within that date range. Filter member by selected payment plan. For example, you could filter by all members with an installment plan. This filter is broken out into 3 sections. You may consider them as 3 separate filters. If you employ the filter for one section, the options for the other sections will be considered selected by default. Section A: This helps you filter by members that have stored the payment information on file with you via an automatic payment token. 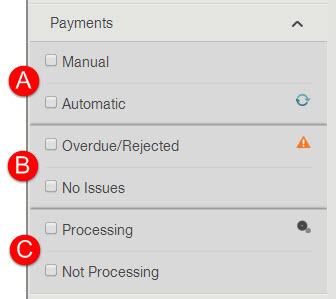 Section C: If a member has scheduled an electronic check payment, it will take 5 to 10 business days to process. Members will be displayed if they have the colored flag that you select. Flags can be added under the Contact Info tab of a member account in the dashboard. Select the date for a future delivery date. The results of the filters will only include members that are scheduled for delivery on the selected date and meet the criteria of other filters set. PLEASE NOTE: If you allow anyone to order from your web store via Guest Store Access, the results of this filter will include members who use Guest Store Access even if they do not have a store order scheduled for delivery on that date. 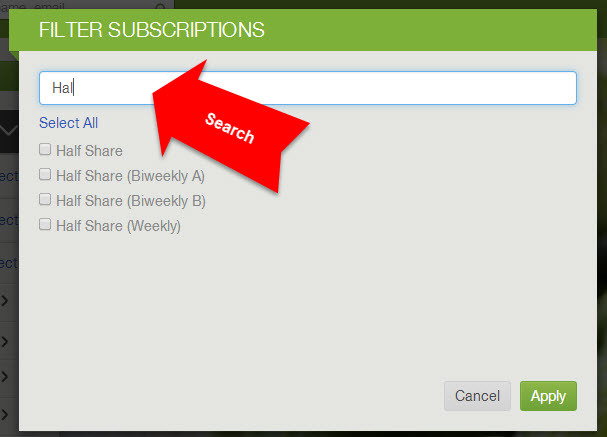 Once you have generated your filter results, click the Email Members button to email the group. You may email them an impromptu message or a template. If you would like to send a physical piece of mail to members, you can use the Member Contact Info Report to get a member's address. Enter a date range to put the selected member accounts on hold. Members on hold will not appear in your delivery reports. If you need to remove the hold before the defined end date, you will need to remove the hold from each member's account individually. Holds may be removed under Details > Delivery & Payment Preferences of a member's account. The selected accounts will be placed on an indefinite hold and will not appear in your delivery reports. If you need to remove the hold, you will need to remove the hold from each member's account individually. Holds may be removed under Details > Delivery & Payment Preferences of a member's account.